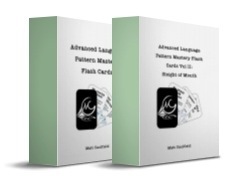 I have just released an updated version of my Advanced Language Mastery Cards. Including Volume II: Sleight of Mouth. Learn to become a highly influential communicator. Make suggestions that are impossible to disagree with. Overcome resistance without argument, tension or conflict. Undo limiting, or reinforce, positive beliefs. Become a master of conversational change. Get to the heart of the problem quickly and easily. Master these skills faster than you thought possible. An explanation of the Polya Patterns of Plausible Inference. These cards a pdf downloaded that you print out. Which means you will receive them immediately and can get started straight way, even if it is 2 in the morning! Click here to get started now! UNFORTUNATELY THESE CARDS ARE NOT CURRENTLY FOR SALE.